Rating the All Time Heavyweights is a difficult endeavor. There are no exact answers. There is no one rating system better than another. It is purely subjective. The following list is what I turned into the IBRO (International Boxing Research Organization) Poll. Their results will be published at a later date. This list is the opinion of one member who submitted his rankings after literally three months of agonizing research and debate. I prefer a "head to head" rating, although I do consider other factors such as longevity, record, quality of opponents etc. The point in my estimation is this, how would the Jack Dempsey of the Willard fight do against the Rocky Marciano of the Walcott fight? How would the Joe Louis of the second Max Schmeling fight do against Evander Holyfield of the Douglas fight? How would a peak Muhammad Ali do against Jim Jeffries in a 15 round fight? How about in a finish fight? NOTE (April 2005): I have made one revision since turning in my list. I decided to use a 15 round standard under Marquis of Queensbury rules to create an equal platform for judging. This mainly effected Jeffries who dropped a few spots. Note (July 2014): My opinions have evolved a little in the last decade. Johnson has dropped some and Dempsey has dropped a couple of notches. In an attempt to be unbiased I have rated them categorically as much as possible. This gives a certain consistency to my list. 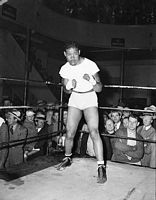 Joe Louis is the best technician amongst all heavyweight punchers, the most complete fighter amongst all the heavyweight champions, the best in a combination of boxing skill and punching power. His punching accuracy is the best ever seen by a heavyweight on film. He has speed, power, and explosiveness, some of the best combination punching ever in any weight class of any time. Louis was the complete package. He holds the record for longest consecutive title reign at nearly 12 years and the most title defenses with 25, 21 of those are knockouts, 17 are ten counts, and 5 in the first round. Muhammad Ali beat the highest class of competition in heavyweight history. He had incredible physical gifts, which were his phenomenal speed, a great chin and razor sharp reflexes. Fundamentally he was flawed having never learned the rudiments of boxing. Based on his athletic ability and quality of opposition I have no problem with Ali being # 1, although I prefer Louis for his superior technical skills and punching power. Jack Johnson was the near equal of Ali as an athletic talent, the best defensive fighter amongst all heavyweight champions, particularly at glove blocking. He had speed, anticipation and athleticism on the level of Ali. He was dominant and rarely lost rounds in his prime. Nat Fleischer, founder of Ring Magazine, saw every heavyweight champion from Corbett to Ali. He wrote, (Black Dynamite Vol. 4 p. 6), “Jack Johnson boxed on his toes, could block from most any angle, was lightning fast on his feet, could feint an opponent into knots…he possessed everything a champion could hope for punch, speed, brains, cleverness, boxing ability and sharp-shooting." He also said, (50 Years at Ringside p. 84), that Johnson’s “mastery of ring science, his ability to block, counter, and feint, are still unexcelled.” He didn’t face the competition of Ali, but physically he was a marvel of the ring. The main reason Johnson has dropped in my ratings is that some of the things he did in his time may not hold up as well in a modern ring, particularly the fact that he relied on stepping back, picking off punches and countering. As Tyson said in the HBO video, "Tyson and the Heavyweights (1988), "that would be so much more difficult to do today" due to more evolved combination punching and "consistent punching". Jim Jeffries: Jeffries is a bridge between the superior athletic talents and the super-heavyweights. He combined good size with excellent athletic ability. He possessed world-class sprinting speed and a 6-foot high jump. Although he was nearly big enough to be classified as a super-heavyweight he lacked the one shot punching power of most of the other big men. One look at his record shows that he was not a hitter in the class of Liston or Foreman. Stylistically he was a bit crude, but given enough rounds Jeffries might be the greatest heavyweight in history. If he survives the early rounds against any opponent he is a threat to win in the late rounds of any fight. He would be favored over most of the great heavyweights in a fight to the finish. He had an iron chin and was never knocked off his feet in his prime and had endurance to maintain a knockout punch past the 20th round. His best punch was his left hook to the head and body. In boxing matches 20 plus more rounds or to last man standing (fight to the finish) he would be favored against most of the top 20, but in a 15 round fight it is difficult to pick him against some of the men rated above him. Jeffries, in particular would have trouble with boxers with quick hands and accurate left jabs. The fact that he leaned forward in a crouch and was completely dominated by Corbett in their first fight before getting caught in the 23rd round demonstrates that other superior boxers could also outbox him over 15 rounds. George Foreman was a destroyer of the ring. The Foreman that annihilated an undefeated Frazier, crushed Norton, and cut the ring on Ali in Zaire was the most awesome heavyweight slugger in history. Ali did not defeat George by outboxing him. He beat him with his toughness. Ali in his autobiography said George had him out in his feet in Zaire and didn’t know it. If Ali took a punch an iota less than he did he doesn’t survive Foreman. I don’t think anyone else survives the ropes against the Foreman of 73-74. After losing to Ali he changed trainers and began to fight at a measured pace. This was a mistake for him. When he lost to Young he didn’t go after him and didn’t throw a meaningful punch until the 6th round. The Zaire Foreman crushes him inside a few rounds. It is a fallacy to say any clever boxer with a good jab could beat him. That is certainly not the way Ali beat him. He did not beat him in ring center. The prime Foreman was a destroyer nonpareil. Very few men would beat the Foreman of 1974. Foreman was the greatest of the super-heavyweights, a freak of nature, he would crush Lennox Lewis inside 2 rounds in my opinion and the smaller swarming heavyweights would meet the same fate as Frazier. His power was such that he regained the heavyweight title at the elderly age of 45. Larry Holmes: A master boxer, an outstanding ring general with good mobility for a big man and possessed a great left jab. He used his height and reach well and although not a huge knockout puncher, he possessed a strong right cross and uppercut. He also had a good chin and loads of heart. Larry was one of the best technicians in heavyweight history and he was solid defensively and had excellent footwork. His 20 title defenses are second only to Joe Louis. Sonny Liston: Although only 6’1” Liston had the dimensions of a “super-heavyweight.” His 84” reach is tied for third longest in boxing history with Lennox Lewis. His fists are the largest of any heavyweight champion, 15” the size of ham hocks. Liston had a powerful shotgun jab to go along with his long reach, and he also possessed debilitating punching power with his powerful left hook and devastating uppercuts. Sonny had a strong chin, failing to last the distance only in the controversial Ali fights and towards the end of his career against Leotis Martin. His overall record of 50-4, 39 knockouts is quite good. He was a solid technician in the ring and one of the few heavyweight greats who fought well inside and outside. That cannot be said of too many fighters. Liston was highly avoided and should have been champ by 1960, if not for Ali he likely would have reigned as champion throughout the 1960's as there was no one to beat him until a peak Frazier. Lennox Lewis: Was a good all around heavyweight champion who at 6’5” 240 pounds and an 84” reach knew how to use his size to advantage. He could box well outside with his long left jab and had a 1st tier right cross that was straight and extremely powerful. He had the size and punching power to knock out virtually anyone. Lennox could be more aggressive at times and was inconsistent in this manner. His chin was not at the highest level as he was twice knocked out as champion. Despite this flaw Lewis defeated every opponent he faced at least once. Vitaly Klitschko: Due to his immense size and athletic ability for a man of his stature Vitaly is a threat to most of the heavyweight on this list, especially the smaller heavyweights under 200 pounds. Vitaly could move well for a big man, had a nice jab and a strong right hand punch and a great chin as he was never knocked off his feet. His competition was very weak and he never met an opponent who could take advantage of his sometimes amateurish mistakes such as backing straight up when hit with a hard punch. He did lose to Chris Byrd when he withdrew due to injury and was stopped on a cut against Lennox Lewis. Some modern observers somehow act like this does not matter but it surely does. On two occasions Vitaly couldn't finish the fight and durability is an important part of the boxing game. In the Lewis fight Lennox hit him with a punch intended to do damage and it did. Cuts end fights. Does the nasty cut Muhammad Ali opened over henry Cooper somehow not count? Of course not. Vitaly would present serious problems to many all time heavyweight but he had vulnerabilities. The fact that he quit against Byrd leads many to question his toughness when faced with adversity which he rarely had to face due to his poor competition. Jack Dempsey: The Manassa Mauler was not only one of the most exciting heavyweight champions in history he was also one of the ring's greatest all time pound for pound fighters. Dempsey has one of the best knockout records in history with a winning streak of 32-0 with 28 knockouts. His 25 first round knockouts are a record in the heavyweight division. Dempsey was a bob and weave swarmer who attacked violently from the opening bell. He could box inside, he could punch, and he could take a punch. He had excellent foot speed and could also maneuver around fairly well for his style. At 6’1” 190 pounds he might be considered smallish by today’s standards but he had the power and ability to knock out much larger opponents as his victories over Willard and Firpo aptly demonstrated. Mike Tyson: The biggest, fastest, strongest and most powerful of the swarming type heavyweights. His speed and explosive power rate among the best ever. In his prime he also had fine defensive skills. Hank Kaplan wrote, that his “defense is the best seen in the heavyweight division in many years.” In his fights with Bonecrusher Smith and Tony Tucker each man only landed one significant punch in their entire fights. Tyson’s perpetual motion bob and weave was designed to make an opponent miss while always being in position to punch. He was very elusive with his upper body. He was able to anticipate an opponent’s attack, slip their punches and counter perfectly. Tyson was one of those fighters who after winning the title could not stay on the top of his game mentally. While lacking the durability and mental toughness of many of the other great heavyweights his physical talent and punching power is enough to defeat many of them. But because he lost his legacy fights (Douglas, Holyfield 1 and 2, Lewis) he cannot rate higher in a historical sense. One has to wonder if he would freeze up and fold against other all time greats who were not afraid of him. Rocky Marciano: Although small at 5’ 10 ¼ and 185 pounds Marciano was a tremendous puncher. He was also a non-stop slugger who wore down his opposition through attrition. A classic swarming style heavyweight who never stopped coming and never stopped punching until his opponents wilted. He was greatly conditioned and often set a relentless pace. Marciano’s tough chin and powerful right hand keep him a threat against most opponents. The only heavyweight champion to retire unbeaten and not come back. 49-0 is his legacy. Why he isn't higher: He never faced a 1st tier heavyweight puncher who weighed over 200 pounds. The two best punchers he faced in his career, Walcott and Moore- aged 38 and 42 at the time-had Rocky on the canvas. Joe Louis is not included since when he met Rocky, the Brown Bomber had long since lost his once devastating punch. Joe Frazier: Frazier was a pressuring, swarming heavyweight who gave 3 minutes of work every round. 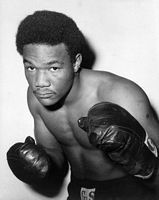 “Smokin’ Joe” was one of the most aggressive pressure fighters of all time. His left hook was among the best in heavyweight history. Frazier was a willing fighter who knew how to get inside and go to work. He cut the ring as well as any fighter in history. His body punching was unrelenting. He had a heart that would not quit, although the quality of his chin has been questioned against the biggest punchers. His only losses are to Muhammad Ali and George Foreman. Riddick Bowe: Bowe was a super-heavyweight at 6’5” 230 plus pounds and with a reach of 81inches. He was also the best infighter among the giants. He had an excellent jab, a strong uppercut, and worked the body very well. But he didn’t dedicate himself the way he should have and lacked proper conditioning except for his peak performance in the first Holyfield fight. The Bowe of that night (Holyfield 1) would be a threat to any heavyweight who ever lived. Beat Holyfield in 2 of 3 contests. Some critics have questioned his chin, but it was solid. His main weakness was lack of a proper work ethic and laziness, which keeps him from rating with the elite fighters. Evander Holyfield: A good all around performer, “The Real Deal” could punch well, box, move, counter, had loads of heart and durability and was a fine ring general. Not among the greatest punchers but he could finish a man when he was hurt. Holyfield mixed great performances with lackluster ones and his inconsistence performances keep him from ranking higher. Holyfield was a good boxer but tended to abandon defense and slug it out and this would hurt him against many of the best punchers. Holyfield also had a tendency to tire in some important fights including Holmes, Foreman, Bowe 1 and 3, and Michael Moorer fights. The fact that aged (40 plus) versions of Holmes and Foreman could do well with him leaves one to believe that the prime versions would have beaten him. Gene Tunney: The “Fighting Marine” was an intelligent boxer with a nice jab, clever footwork, and solid punching. He also possessed a strong chin and was down only once in his career. Tunney was a master boxer who could find the weakness in any opponent's style and exploit it. Was at his peak at light-heavyweight, where I rate him # 2 amongst all 175 pounders, but he was also a very fine heavyweight boxer deserving a ranking among the 20 best ever. James J. Corbett: Slick and quick Corbett was a master boxer who at an old age impressed Gene Tunney while sparring. Corbett had great stamina, mobility, and a fine jab. He weighed near or at 190 pounds. He was intelligent and innovative, Corbett is often credited as being the inventor of the left hook. Corbett was also an outstanding amateur winning a Golden Gloves Championship and Seven Silver Championship Cups in Amateur Boxing on the Pacific Coast. He frustrated his opposition with clever out boxing and counter-punching. Ezzard Charles: The “Cincinnati Cobra” was an excellent boxer who looks very good on film. He had speed of and hand and foot, mobility, sharp accurate punching, flashy combinations, countering ability, and endurance. He was an expert technician. Ezzard possessed a knockout punch until the death of opponent Sam Baroudi, after that he was more content to outbox opponents than really hurt them. He was at his peak as a light-heavyweight defeating Archie Moore 3 of 3. He made 9 successful defenses of the heavyweight title. His chin is somewhat suspect as he was knocked out several times. Jersey Joe Walcott: Crafty, cunning and possessor of a strong punch Walcott was a master at feinting and counter-punching who also possessed clever footwork. His slick moves, jukes, and perfectly timed counters would cause problems for many a great fighter. The oldest man in heavyweight history to win the title until George Foreman. 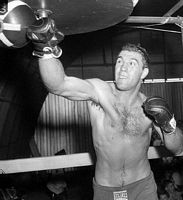 Max Schmeling: A very smart counter-puncher with a strong right hand. He knew how to feint and set his man up. He was a good all around performer in the ring. Nat Fleischer regarded Schmeling as the most under-rated of all the heavyweight champions that he saw in his lifetime. Hank Kaplan noted Schmeling had “the best straight right hand, down the pipe and between the gloves” that he had ever seen on film.